Holds four 5.56 magazines. 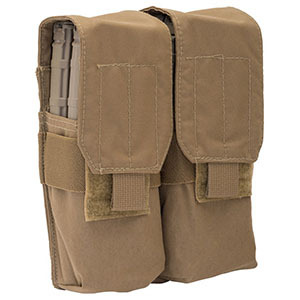 Pouch utilizes a Velcro retention system, securing the magazines until needed. The outer layer is constructed from beefy 500 weight solution dyed Cordura®, fabric that improves and softens with time and wear. Very durable without being heavy. Reinforced Kevlar stitching on stress points. T3 Maritime MOLLE Closure System is included with every T3 Pouch. T3 MILSPEC bar tacked solution dyed webbing. Compatible with all Molle/modular webbed systems. Reverse stitching is used wherever possible to enhance durability. Minimal use of binding tape. This Magazine Pouch is available in 5 colors including Black, Coyote, Multicam, Desert Digital and Olive Drab.